For tourists and citizens of Ferrara from December, 2011 is available a guided tour of the ancient ducal residence of Ferrara, now the city hall. A trail that winds through the history and artistic features of the building panels made by illustrative, in Italian and English, placed at points of interest. 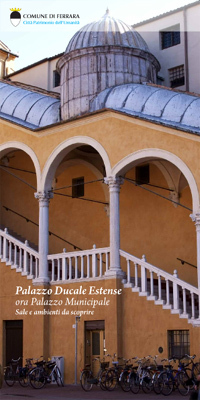 Two leaflets, distributed free of charge and downloadable from this page, enable you to grasp the historical context within which the palace has developed over the centuries, and offer insight into the Duchesses’s Camerino, one of the most fascinating areas of the prestigious palace of the Renaissance. For visitors with smartphones, mobile phones and mobile devices of last generation wi-fi, you can be led by audio guides available free of charge via the QR CODE labels, placed along the path here to visit and experienced for the first time in Ferrara in the promotion of cultural heritage. To allow the completion of restoration work and the interior, the Golden Room is currently not included in the tour.